Being a Punjabi, I have some special love for non-veg. Not much a foodie though, but I do have a palate for non-veg. With so many different kinds of non-vegetarian dishes, it can be confusing what to try first. In India, there are unique preparations using the regional flavors and spices that make it an amazing experience. Butter chicken one of the favorites in India and specifically speaking the Punjabis. 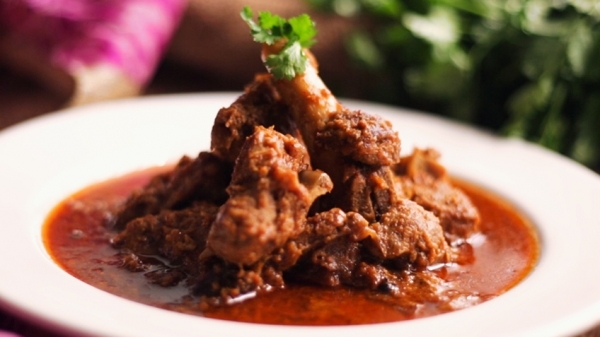 But that is not the only option; you can try Malabar fish curry, Mangalore chicken curry, Goan masala prawns, Kosha Mangsho, Laal Maas, Amritsari fish and Rogan Josh and many such amazing cuisines. If you are looking for some mouth watering non-vegetarian dishes you must try the ones in our list. Fish and chips, steaks, barbecued pork ribs, grilled chicken, meatballs are some dishes that are not just a part of almost every non-vegetarian food hub but these are also some dishes that are a delicacy to be prepared at home. So here we are with the 10 best non-vegetarian dishes and it’s recipes for you. Be it a chicken, mutton, pork or a fish lover. We have something for each one of you. You need to marinate the chicken in home-made spice powder and green paste. You must then grill it to perfection. Observe when it is slightly dark brown and crisp you may consider it grilled. It is served with a fresh salsa of grapes, spring onion and cherry tomatoes. Prepare the spice powder by grinding fennel, pepper, cinnamon powder, star anise, and roast till it turns into powder. Take 1 cup mix of parsley, the green part of the spring onion and coriander and blend them into a smooth green paste. For about half an hour marinate 1 skinless, boneless, chicken breast with salt, pepper, 1tbsp spice powder and green paste (for about half an hour). Cook in a hot pan with 4 to 5 tbs. of oil or grill it. Toss ½ cup green or black grapes, ½ cup chopped spring onion and 1 cup cherry tomatoes, 1 tbsp green chili chopped, 1 yellow bell pepper chopped, 1 tsp chopped parsley, 1tbsp chopped coriander, 2 basil leaves, 1 tbsp lemon juice, 2tbsp olive oil, salt and pepper for the salsa in a bowl, refrigerate until needed. Serve with the prepared chicken. It is an appetizing mutton curry. The meat is stirred with curd, garlic-ginger paste, cloves, cardamom and cinnamon sticks. Heat about ½ bowl oil in pan, add the finely sliced onions (1 onion) and fry them until they turn light brown. Add the mutton (700 gram), 3-4 tbsp curd, 1 tbsp salt, 1 bowl of water, 2 tbsp coriander powder, 1 tbsp red chilli powder in a pan and stir for a few minutes. After a few minutes add the spices- 1 tbsp garlic, 1 tbsp ginger, 3-4 cloves, 2-3 whole green cardamom and 2-3 whole cinnamon sticks and mix well. Cover it and cook for about 30 mins on a slow fire, then add 2 tbsp fried onions and stir again. Cook for another hour until done. Garnish with onions and serve your guests. Its ingredients contain a Rum based cocktail that is mixed with pork ribs to create a delightful treat. Pork is slow roasted to soak in the flavors, and the addition of ginger to it, makes it even more amazing an experience. In a large mixing bowl, add 2 cups pineapple juice, 1 cup rum, 1 Tbsp ginger paste, 1 Tbsp mint paste, ¼ cup grated jiggery, 1 Tbsp chili flakes and salt. Mix well. Add the pork's ribs (6 pieces) and coat well with the marinade. Leave it for 6 hours in the refrigerator or overnight. Pre-heat the oven to 150 degree C and place the pork ribs evenly in it, apply oil on the floor of the tray. Pour in the leftover marinade. Add the fresh mint leaves. Bake in the oven at 300 degree C for 45 minutes. Make sure that you flip the pieces after 30 minutes and cool both the sides nicely. The fat layer of the ribs will start to ooze out oil and the meat should be well-cooked and roasted. 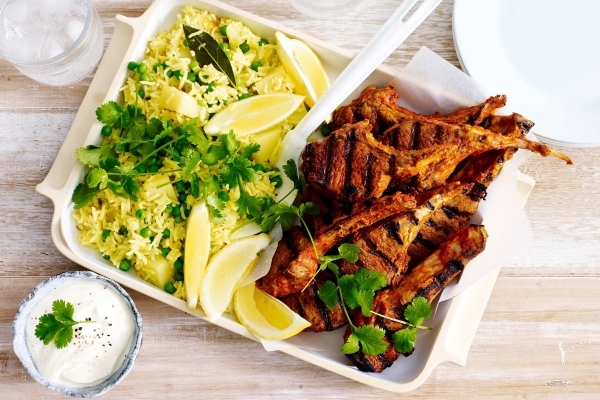 Lamb chops marinated in yogurt and scrumptious masalas. It is cooked till it becomes tender. This dish will surely tickle your taste buds and all those that wish to experiment with their food, this is a must. Combine ¾ c Greek yogurt, 1 ½ garam masala, 1tbsp turmeric, 3 garlic cloves, 1 tbsp lemon juice, 2 tbsp paprika, ½ cayenne pepper, and 1 tbsp salt in a bowl and stir until fully mixed together. Pour marinade into a bowl and add 6 lamb chops. 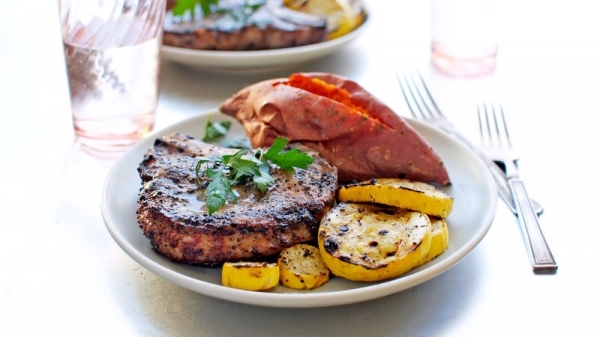 Coat the lamb chops with marinade. Remove chops from marinade and scrape off excess. Place chops on grill and grill for 2-3 minutes on each side. Indian spices like turmeric powder, ginger, garlic and chilies added to the fried fish makes this a delight for the food lovers. Tomato and yogurt adds to the thick and mouth watering gravy. To top it up you can add some lemon juice to it. Take 250 gm onions and cut them into slices. Heat oil and add 1/2 cup ghee in a pan, and fry the onion till it turns golden brown. Fry 2 tbsp cashew nuts and 2 tbsp raisins and keep aside. Apply turmeric powder, salt and little water on 1 kg seer fish. Heat 2 tablespoons oil in a frying pan. Fry the fish till half done and keep aside. In a deep vessel, heat 3 tablespoons of oil. Grind the remaining onion with 1/2 cup water. Add this onion mixture to the hot oil. Crush 70 gm ginger, 70 gm garlic and 100gm green chilies. Add this paste to the onion mixture. Stir well. Add tomatoes, yoghurt and salt. Cook for some time till the water evaporates. 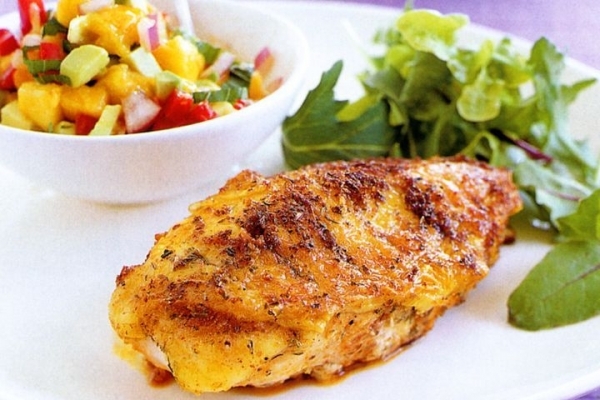 Add the fried fish pieces, 1 cup coriander leaves and lemon juice. Keep aside. Heat ghee in a non-stick vessel. Add 1/2 chopped onion, 3 pods of cardamoms and 3 cinnamon sticks. Immediately add the washed rice (drain without any water). Add boiled water and salt and cook till the water is absorbed by the rice. Keep the rice covered for 10 minutes and add a pinch of garam masala powder to the rice. Now take a heavy bottomed vessel and add the cooked rice in one layer. Add a few spoons of the fish masala. Add some fried onion, nuts and raisins and a little garam masala powder and cover with a rice layer. Layer it up. Take a napkin, dampen it with water and cover the vessel. 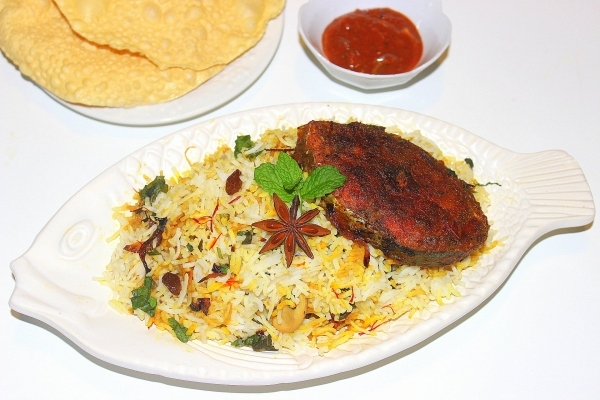 Put the biryani on gas for 1 hour with light heat for the flavors to develop. Serve hot.